That sound of thunder in the distance last night wasn't another summer storm rolling through. It was the White Sox bats coming alive against Twins pitchers. It didn't matter that Magglio Ordonez wasn't in the lineup, the previously over-the-hill Big Hurt and Paul Konerko of the "I can't buy a hit or homer" variety more then made up for his absence. This could have been the night the White Sox finally sent the message that they deserve respect. That all their millions had not been wasted for a third year in a row and that their manager, though inexperienced, was the real deal. Too bad their amazing night came against a guy that wasn't even good enough for the Tigers, let alone the Twins, last year. That's right: Seth Greisinger was so bad that those Tigers of the 119 loss ilk chose not to retain his services during the past off season. No matter: the Twins after 2 mediocre outings and one outstanding one eagerly declared them their fifth starter. Despite having a former (albeit inflated) 20-game winner in the minors most Twins fans quickly joined the bandwagon. Some even speculated on the possibility of Greisinger passing Kyle Lohse in the hierarchy of the rotation. After all, why not? Here was a former high draft pick coming off of surgery who was still relatively young and seemingly finally putting it all together. What many of us failed to do was look more closely at the situation. Greisinger pitched 37.7 innings last year with a whopping 6.21 earned run average. This year he began the season in the minors and upon being called up was promptly pummeled in his first outing. People then pointed to his earned run average as a starter which was under 4. In those starts Greisinger has pitched more then 5 innings exactly once and that was his great outing. Perhaps his great outing was the aberration. 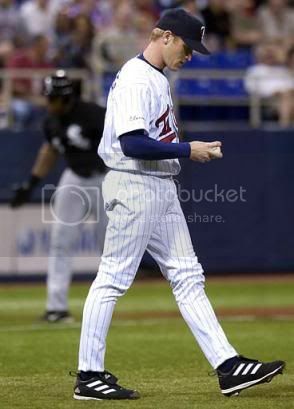 Remember, even Rich Robertson once threw a shutout for the Twins. In all his other outings Greisinger far exceeded expectations and did what a fifth starter is supposed to do: he kept the team in the game long enough to hand it over to the bullpen. He was not a horse and he was far from great. Eventually the Twins are going to need a real fifth starter this year. One who can eat innings when the rest of the starters are struggling and the bullpen is burnt out. Greisinger has never shown himself to be that man. That's why it would be a mistake to just hand Rick Helling over to another organization. It will happen though and the team will be kicking itself within a couple of weeks after suffering through several more outings like the one last night. Greisinger will return to form and so far during his major league career what we saw last night is it. The kid is not so young, does not have amazing stuff and has barely held his head above water this season and still the Twins insist on presenting him the keys to the car. This is a move that will come back to haunt them. Notes - The injury bug continues to plague the Twins this year. While they have done an admirable job overcoming them to this point it might be time to call in reinforcements. The only upside to not doing so is that it shows a tremendous amount of disregard for the abilities of the White Sox in this weekend’s series. Then again, losing the series one game to three would be hard to stomach. Especially when the Twins have the quality of hitting they do at AAA. Justin Morneau has done everything possible to show he is ready for another chance and for once the team has room to get him regular at-bats. What he adds to this team is much needed power and hopefully a certainty that Jose Awfulman won't ever be called on again to bat clean up. The only reason the Twins might hold off is because when they make the call they want him to be able to stick. He is not the type of player they want to yo-yo back and forth between the bigs and Rochester, especially if he is doing well. Mike Restovich would also be a good candidate for a call-up. He is finally living up to his hype and deserves a reward for all his hard work. 10 homeruns so far this year are hard to ignore and should Shannon Stewart go on the DL he would be a great option to play left for a couple of weeks. There is a possibility that no one will go on the disabled list and that a pitcher will be sent down to make room on the roster. This leaves the Twins with a difficult decision. It basically is between Joe Roa, Terry Muholland and Grant Balfour. Some have already labeled Balfour a key to the Twins bullpen. He is out of options and has great stuff, not to mention that the time the organization has invested in him, making him the least likely to be sent out. Roa might be the easiest to keep but it's probably unlikely they will sneak him through waivers either. He has pitched too well this year and if the Twins let him go he will no doubt contribute to some other team. The best choice would be Greisinger but the Twins seem to feel he deserves several more starts in which to implode and prove that he lacks major league talent. It's amazing how some of the AAAA pitchers brought in during the off-season have really made the bullpen a strength and a place of depth so far this season. Ron Gardenhire is terrified of losing a catcher by DHing Matt LeCroy. This has left the lineup little flexibility in the last couple of days. It would be terrible if a catcher were injured and the Twins lost the DH but when you weigh that with what a hot LeCroy bat adds to the lineup it would appear to be worth the risk. LeCroy in the lineup over Awfulman is definitely a bonus every game it happens. Heck, I'm not convinced Awfulman is that much better then the pitcher hitting anyhow. He belongs on the bench in a pitch hit role where his veteran presence means something. If that's what he was brought in for that is where they should use him. Look for Carlos Silva to bounce back tonight. The team needs a big win and Silva just seems like the guy to give it to them. He has shown a resolve on the hill this year that is unlikely to go away anytime soon. As long as his sinker is working he will be tough on the Sox and keep the ball in the park. This would allow the Twins to stay in the game long enough for Jacque Jones to work his magic and make his first hit off of Mark Buehrle a game winning homerun! Greisinger looks away as Frank Thomas rounds third during his HR trot. His performance on Thursday wasn't quite what the Twins had in mind.